Replacing the default Run As local account (NetworkService) with a domain account. If you are operating in an environment where a majority of your data sources are authenticated in the context of Active Directory (Windows NT integrated security) then you will need to configure the Run As service account to use a domain account, not the local account (NetworkService). Changing an existing domain Run As service account to a different account. This topic describes both scenarios and describes how to update the Run As service account password. Create a dedicated account in Active Directory for the Tableau Server Run As service account. In other words, don’t use an existing account. By using a dedicated account you can be sure that the data resources that you permission for Tableau Server are only accessible by Tableau Server Run As service account. The Run As service account is used to query users and group membership in Active Directory. By default, the NetworkServices account and default domain users have permission to query Active Directory. Do not restrict read or query permissions for the Run As service account. Do not use an account with any kind of domain administrative permissions. Specifically, when you create an account in Active Directory, create an account in the domain User Group. Do not add the account that you create to any Active Directory security groups that needlessly elevate the permissions for the account. Permission the data sources in your directory for this one account. The account that you’ll use for Run As service account only needs Read access to the appropriate data sources and network shares. If users in your organization authenticate with smart cards, disable the smart card logon option for the Run As service account. If you have installed Tableau Server on a drive other than the system drive, then you will need to configure the system drive to allow the Run As service account additional permissions. The system drive is the drive where Windows is installed. For example, if you have installed Windows on the C:/ drive, then C:/ is your system drive. If you install Tableau Server on any other drive (D:/, E:/, etc), then you will need to configure permissions for the Run As service account on the system drive. See Required Run As Service Account Settings for more information. After you have created the Run As service account in Active Directory, configure Tableau Server to use that account. Use the TSM Web UI to configure the Run As service account for the first time. Click the Security tab, and then click the Run As Service Account tab. Click Save to verify the user name and password. When you are finished, click Pending Changes, and then click Apply Changes and Restart. After you update the Run As service account, Tableau Server will automatically configure permissions on the local computer for the account that you have entered. To change an existing domain Run As service account to a different account, you must apply permissions to that new account. To apply permissions to your new Run As service account, you must first reset permissions by applying them to the default NetworkService account. Before you begin, verify that the new account that you will be using for the Run As service account complies with the best practices noted previously in the section, Creating the Run As service account. This procedure requires you to restart Tableau Server services twice, so run this procedure during off hours. 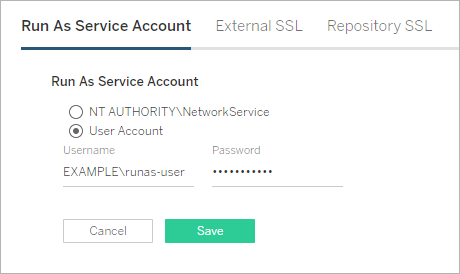 Under User Account, select NT Authority\NetworkService. After the server restarts, open TSM and navigate to the Run As Service Account tab. Revoke the permissions for the previous account. See Revoke Run As Service Account Permissions. The password will be validated with Active Directory. If valid, then the password will be encrypted and saved. TSM will not report success or failure. If the previous password is displayed, then you did not enter a valid password. If the Run As service account password has been updated in Active Directory you must update it for Tableau Server. The Run As service account password is encrypted and stored on Tableau Server. For more information, see Manage Server Secrets. If you are running Tableau Server in a distributed deployment, then you only need to update the password with TSM on the initial node in the cluster. TSM will distribute this configuration to each node automatically. Under User Account, enter the password for the service account. Click Save to verify the password. In some cases, you may see service failures after updating the Run As service account password. If so, then you may need to manually update the password for the Tableau Server Services Manager service. Update the password in the Microsoft Services management console. If you are running Tableau Server in a distributed deployment, then you must perform the following procedure on each node in the cluster. Open the Services MMC snap-in on the Windows computer that is running Tableau Server. Double-click the Tableau Server Services Manager service to open the properties page. On the Tableau Server Services Manager Properties page, click the Log On tab, and then enter the password for the service account. Restart the Tableau Server Services Manager service by right-clicking on the service name and then clicking Restart. To use the TSM Web UI, on the top right of the page, click the drop-down list next to the status, and then click Start Tableau Server. The Run As service account is central to many operations on Tableau Server, especially those that are involved with remote data access. To avoid access errors, review the tasks here and follow the links for those that apply to your scenario. If you are running Tableau Server in an organization with multiple Active Directory domains, see Domain Trust Requirements. Enabling Kerberos single sign-on requires additional configuration related to the Run As service account. To enable Kerberos single sign-on with Tableau Server, see Kerberos. Enabling impersonation requires additional configuration related to Run As service account. To deploy and enable impersonation with Microsoft SQL Server, see Impersonate with Embedded SQL Credentials. If you have installed Tableau Server onto the non-system drive, then you will need to manually set some permissions for the Run As service account. See Required Run As Service Account Settings for more information. If your organization uses a forward proxy solution, then you may need to reconfigure the local LAN settings on the Tableau Server with the Run As service account. See Configure a forward proxy server for more information. In this scenario, the Run As service account must also be temporarily configured as the log on account for Tableau Server Administrative Controller for product key operations. See Configure Product Key Operations with Forward Proxy.